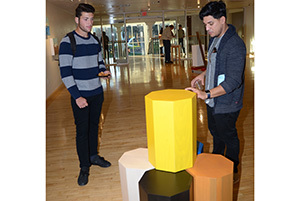 Chicago artist Josué Pellot (right) discusses his “Giant Pegs” artwork with Tim Brackett, an Upper Iowa University graphic design major, during the opening of Pellot’s Double Bluff exhibit in November 2016. Nine featured exhibits have been scheduled for the 2017-18 Bing-Davis Memorial Gallery artist schedule. The 2017-18 Bing-Davis Memorial Gallery artist schedule features a wide range of art media, including painting, illustrating, printmaking, murals, ceramics and sculptural installation. The printmaking and sculptural works of Eric Fuertes will be the first of nine scheduled exhibits showcased in 2017-18. The Fuertes exhibit will open Thursday, August 31, and conclude with a closing community printing event on Thursday, October 5. Additional information about the artists and their respective exhibits will be announced at a later date.